At its core, Dragon Ball is the story of Son Goku working in every facet of his being to become the strongest martial artist he can be. It is this specific distinction away from “the strongest martial artist of all time” that ultimately defines both Goku and Dragon Ball as a narrative. Thematically, Dragon Ball establishes rather early that there will always be people stronger than Goku. While specific to the character, this is a universal lesson meant to prevent complacency. Son Goku’s arc is self-betterment for self-betterment’s sake. 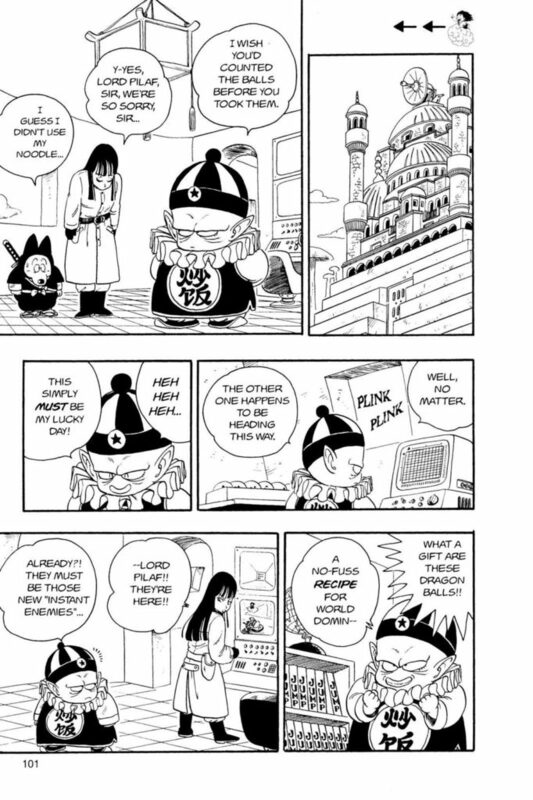 As the series progresses, author Akira Toriyama begins to challenge this philosophy either by introducing characters who serve as antitheses to Goku or by simply breeding conflict from Goku’s desire to grow stronger. Regardless of which path Toriyama pursued for any given situation, all roads lead to a protagonist who embodies his story’s core themes in every sense. That said, Dragon Ball did not begin with a solid foundation for its protagonist or what would become its many themes. Rather, it would not be until the second story arc, the 21st Tenkaichi Budokai, where Toriyama would establish in earnest where both Son Goku and the series would be heading on a thematic level. Although there is a sense of wonderment to Goku’s character in the first arc that transitions into his series long arc, along with inferring the approach the rest of the series would take, it is clear, in hindsight, that Akira Toriyama was not sure where to take the story initially. Of course, given Toriyama’s “seat of the pants” writing style where he would effectively improvise from chapter to chapter, said take can be applied to Dragon Ball’s run as a whole. But even in the event where Toriyama was unsure where his plot would go, both his characters and themes were established well enough to naturally drive any arcs, both character and narrative, forward. 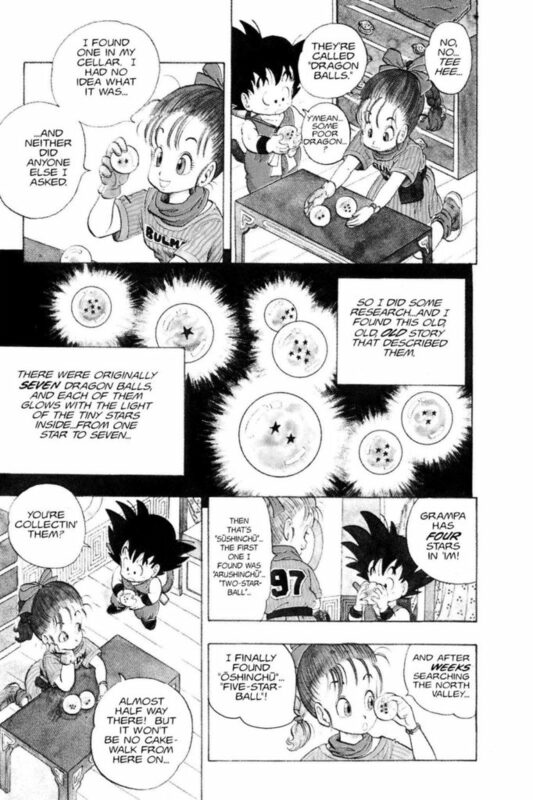 The series’ first arc, the Hunt for the Dragon Balls, is alone in this regard where Toriyama has nothing to guide him from chapter to chapter. The series has just begun and neither its themes or arcs have been established. This is, however, an issue only exclusive to the manga. The premiere of Dragon Ball’s anime adaptation, appropriately titled Dragon Ball, first aired on February 26, 1986. On this day in the manga, Goku had just defeated Murasaki in the series’ 61st chapter which took place in the third major story arc, Red Ribbon Army. Given pre-productions times, it is likely that the anime adaptation began development at some point during the 21st Tenkaichi Budokai arc, which is quite clearly evidenced by both Kuririn and Lunch, characters introduced in said arc, appearing in the ending credits as early as the first episode. The point being: where the manga needed to craft its arcs and themes, the anime already knew in advance where the series was going both thematically and narratively. This, in itself, poses a question: should an adaptation seek to improve upon its source material or present it as is? Dragon Ball, as an anime, aims for a dual layered approach. It will present the manga as it was originally published as thoroughly as possible, while also attempting to enhance certain details in the process. The anime does not always succeed in improving upon its manga counterpart, occasionally going so far as to create anime specific plot inconsistencies in straying away too far from Toriyama’s source, but, at least in the case of the series’ first arc, the anime does do an apt job at staying true to its source material while crafting a more unified story arc. As an adaptation, and a rather direct one at that, there is only so much the anime can do with Goku’s character without compromising the integrity of the original series. As a result, while Goku is still the first character audiences are introduced to in both mediums, along with being the definitive main character, the focus of the arc is more centered around Bulma and her growth instead of on any meaningful development for Goku. With the exception of Yamcha’s companion, Pu’er, Goku is the least developed member of the main cast between both mediums. Bulma goes from a self centered, spoiled brat who only wants to use the Dragon Balls to wish for a boyfriend, to someone who developed a genuine friendship with Goku while finding a meaningful relationship in Yamcha; Oolong goes from a relentless pervert only looking out for his own skin to the very character who ends up saving the world at the end of the arc; and Yamcha goes from a literal bandit and Goku’s first rival to a genuine companion who looks out for his friends even in the face of his own fears. They’re all relatively minor character arcs, but the brilliance of Toriyama’s writing is that his characters are so well characterized that even a minor arc can have a major impact. In that sense, it isn’t as if Goku isn’t a defined character in the first arc. He is naive, loves eating, has a pure heart, finds the wonder in all of life’s little moments, and has quite the penchant for martial arts. The problem with Goku is less with his characterization and more with his motivation, or lack thereof. Bulma, Oolong, and Yamcha all have clear motivations as to why they allow themselves to assimilate into a group with Goku and why they set forth to hunt for the Dragon Balls in the first place. Bulma wants to wish for a boyfriend; Oolong is effectively being held hostage and his deliberate lack of motivation for being present directly ties into the completion of his arc; and Yamcha is initially pretending to be a part of the group so he can steal the Dragon Balls in order to wish his fear of women away. Goku has no such motivation. He is only on the quest because Bulma appealed to his better nature. He is, in this arc, a backseat protagonist at best. This is consistent between both the anime and manga as, despite knowing what Goku’s motivation would become in advance, the anime staff chose to adhere to what Toriyama originally put to paper during the course of the first arc. This isn’t necessarily a negative, however. At least not for the anime specifically. An adaptation’s job is to adapt material, and Goku’s character is adapted rather faithfully. Interestingly, where Goku was left relatively untouched for the most part, just about everyone else in the main cast gets enough added focus where they are arguably more fleshed out characters in the anime than in the manga. Particularly, Pilaf and his cohorts come out of the anime richer characters than they ever were in Toriyama’s source material. Rather than waiting until the end of the arc to introduce its villains, the anime has Pilaf appear from as early as the first episode. Pilaf’s journey to collect the Dragon Ball’s contrasts Bulma, and creates a sense of growing tension as Goku and company gradually get closer to finding all the Dragon Balls. Shifting events around so Pilaf appears as early as possible not only adds stakes in the background, it also ensures the audience that the arc is more than a series of loosely connected vignettes revolving around Bulma and Goku finding the Dragon Balls. Sooner or later, they’ll find themselves in conflict with Pilaf over the last few Dragon Balls. It is also worth noting that while the anime leaves Goku relatively untouched in terms of arc and motivation, Bulma’s arc is enhanced by new scenes. The second episode in particular establishes Bulma’s want for a boyfriend by painting her as a hopeless romantic. Rather than quickly transitioning into Bulma giving Goku a bath as per the manga, she flips through channels on her television and stumbles upon a romantic scene where she becomes completely enamored with the moment, showing the audience a softer, almost comical, side of her while also inferring her arc. This does, however, shine light on one the anime’s most prominent weaknesses: pacing. Dragon Ball, the manga, is an incredibly fast paced narrative. Toriyama rarely allows himself to stop and spotlight a moment before moving on. This is not a flaw, however. Rather, it is one of the manga’s greatest strengths. Akira Toriyama can convey so much information and emotion in one panel that he can afford to write a story that moves at a brisk pace. 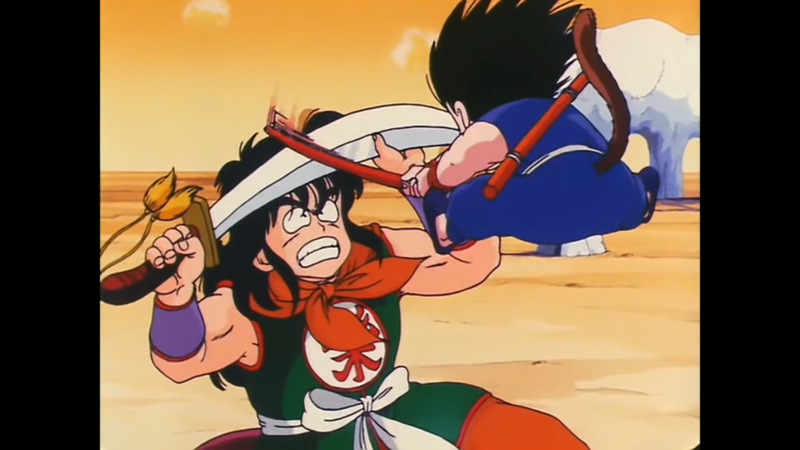 Goku’s fight with Yamcha lasts a total of nine pages before coming to an end, but the action is so defined in each panel that it nonetheless feels like a fully fleshed out battle with a clear sense of progression from start to finish. Although the anime does do a relatively good job at bringing Toriyama’s panels to life, especially early on, Toei has a habit of slowing down each moment. This is more evident later on in the series, particularly with the Red Ribbon Army arc and the entirety of the Dragon Ball Z adaptation, but the slower pace is present throughout the entirety of the anime. This is to say nothing of the anime’s tonal issue, at least in the earlier era. Although Dragon Ball certainly has a comedic tone in the manga, especially in the first three arcs, Toriyama rarely, if ever, revels in his own humor at the expense of moving the plot forward. Compare this to the anime where early episodes are peppered with additional jokes to pad out run times. Of course, it should be noted that this is done deliberately in order to keep the anime from catching up to the manga, a feat Dragon Ball would ultimately end up pulling off rather quickly, but it does not exempt the anime from criticism. More often than not, the anime’s inability to match the manga’s pace is in detriment to the Dragon Ball experience. The slower pace isn’t all bad, though. In fact, the anime arguably punches up all of the manga’s biggest moments with a considerable amount of grace. One simply has to look at Kame Sen’nin first Kamehameha between both mediums to have an idea of how the slower pace can actually benefit Dragon Ball at times. Where Muten Roshi’s Kamehameha is over and done within three pages in the manga, albeit three incredible pages, the anime very slowly and methodically plays the blast out over the course of two and a half minutes. 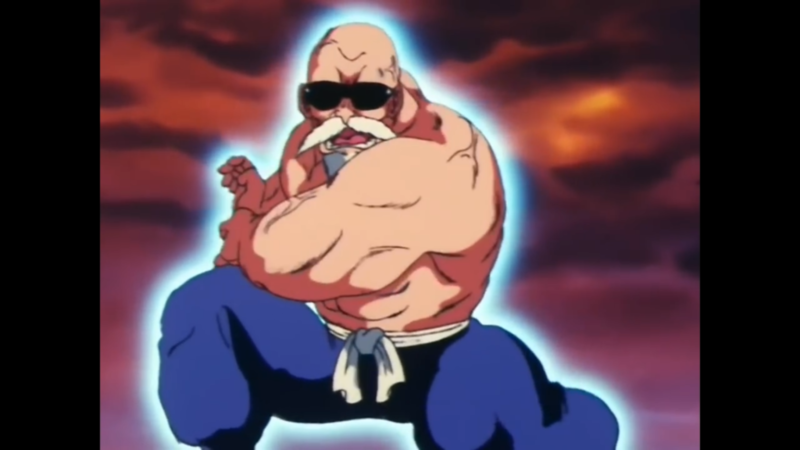 Each second is used to build up to Roshi’s blast, ensuring the audience understands just how important of a moment this is. It is in Kame Sen’nin’s Kamehameha where Dragon Ball begins to further solidify its focus on martial arts. This is a moment which unquestionably changed the direction of the series, planting a seed that would grow into the franchise’s core themes, while allowing Goku to develop as a character. It is monumental, and the anime uses its slow pace to build tension, add weight to impact, and de-escalate from the intensity of such a moment. It’s in these moments, when the anime fully understands the core tenets of Dragon Ball, where it is able to create a moment that transcends even that of the manga.